Everybody has had the inspiring experience of reading great advice or wisdom for improving their life. But that initial enthusiasm is rarely enough to sustain the long-term effort needed to convert that advice into ingrained habits, and the opportunity to transform our lives is lost. Life Mastery Trainer is designed to not only help you integrate those practices into your daily life, but also create a community of users sharing and rating their favorite practices for a wide range of situations. I've been working on it with a team for over a year, and we just got it approved by Apple for the iTunes app store last week. Apologies for putting a non-Houston-related post on the blog, but it's really hard to break out of the clutter of 100,000 other store apps. If we can get enough sales to get on some of the top lists, then thousands of other iPhone and iPod Touch users will be able to discover it and improve their lives. Please also consider mentioning it to your friends via email, blog, Facebook, Twitter, etc. Here's the direct link to the app in iTunes. And here's the link to the community web site with the app description, screenshots, forums, and the ability to submit new practices (it's pretty basic right now, but we plan to expand and improve the site soon). Deepest thanks for your time and consideration. And may you have a masterfully Happy New Year/Decade! The Houston Chronicle editorial board recently called on Mayor-elect Parker to essentially 'tread lightly' when it comes to Metro, so as not to potentially jeopardize federal funding for the new rail lines. While I think everybody would agree we don't want to put federal funding at risk with any clumsy moves, an immediate deep-dive audit and analysis of Metro's cloudy future plans and financials is absolutely called for. There are big money bets being made here that require fiscal due diligence and a fiduciary duty by the mayor, who appoints the majority of Metro board members. 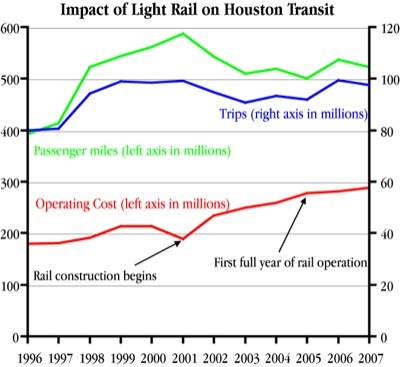 "In short, for a $300 million capital cost, light rail significantly increased the costs of operating Houston transit while it killed the growth in transit ridership and significantly reduced passenger miles." I myself worry that much of the line's ridership is simply as a parking shuttle for the Texas Medical Center - something future lines won't benefit from. "METRO has failed to honor the main promises made to voters in the 2003 “Solutions” referendum; that of a 50% INCREASE of bus service. Further when voters approved the “Solutions” plan in 2003, the urban rail portion was to be 22 miles, costing $1.2 billion ($54.5 million/mile). Today, it is a 30 mile rail plan, and the cost is in the range of $4 billion ($133.3 million/mile)!" Using the $1.46 billion contract as the basis for calculations, the average cost of the four corridors will be $68 million per mile. The average based on the (FTA) letters of no prejudice amounts for the North and Southeast corridors would increase the cost to $159.4 million per mile. It would also increase the cost of the East End Corridor to $527.7 million and more than double the price of the Uptown Corridor to $688.8 million. That would bring the estimated cost of the four lines to more than $3 billion. Separately, the 11 miles of the University Corridor not included in the contract would be more than than $1.7 billion. $4.7 billion is a truly staggering amount of money if that turns out to be the true cost - way, way beyond the $640 million bond issue voters approved in 2003. Finally, a statistic that sort of jumps out at you: Is Metro spending $150,000 for each new transit rider on the new rail lines? (about what it would cost to give each rider a lifetime supply of cars) Ouch. An op-ed on the slow-motion fiscal disaster of Austin rail. A lot people think Houston Metro is a similar financial bind, but just doing a better job of hiding it. A similar story from Denver's multi-billion dollar FasTracks program, with details of huge cost underestimates, over-hyped congestion and environmental benefits, and traffic snarls from at-grade crossings (sound familiar? Are we about to make the same mistake?). Their proposed answer? Better bus service. The disaster of San Jose transit. And that's just a sample of the dozens of transit agencies in trouble, looking for either taxpayer bailouts or draconian service cuts. Houston has a real chance to make sure we don't make the same mistakes. As far as federal funding, it is important, but it's not everything. An analogy: if a salesman offers a $200K Ferrari at half-price with a $100K government subsidy to a middle-class family (and, to make this analogy match rail, they can't resell it), it's still a financially imprudent and disastrous move - subsidy or not. The goal is not maximizing federal subsidies - it's building a sustainable, affordable, functional, high-ridership transit system. She faces a difficult financial situation at the city, and obviously her first priority will be getting that under control. In addition to those short-term pressures, there are the long-term financial issues of city employee pensions and Metro's solvency, with rail cost estimates spiraling upward and revenue shrinking. If she does nothing else in the next two years but fix those financial problems and get the city and Metro on a sustainable financial path (without raising taxes), she'll have one of the most accomplished mayoral terms in city history and will more than deserve two follow-on terms. A broad city philosophy of Opportunity Urbanism (including the policy appendix, more here: Opportunity Urbanism, 4 drivers op-ed, and response to critics). Also it's worth reviewing how not to become California. Collaborate with Houstonians for Responsible Growth on their initiative to streamline and improve deed restrictions to protect neighborhoods. Creative ways to fund more police and innovative ideas on crime reduction in the Economist, mainly through deep relationships in the community. Excellent ideas for Houston to try under our new mayor and chief of police. I'm particularly a fan of GPS tags to prevent recidivism. "The lesson of High Point is that you can reduce crime by making credible threats, without having to lock up so many people. To deter, a punishment must be swift, certain and severe....Mr Kleiman suggests several other promising, non-macho approaches to curbing crime. Raise alcohol taxes. Start school days later to prevent after-school crime. Force probationers to wear GPS tags, thus making probation a tough (and much cheaper) alternative to prison. Americans should experiment with such ideas, he says, and if they are serious about justice, the object should be to cut crime, not to make criminals suffer." A great quote I came across: "Those who argue that it doesn't pay to build a road because it just fills up again should test that argument on libraries, schools, and hospitals." Alan Pisarski, author of Commuting in America. At the bottom of page 3 in this pdf from the Greater Houston Partnership you can find a detailed analysis of how long it will take the city and metro of Houston to pass up Chicago (#3) and LA (#2). It's a lot longer than you might think, unless something big happens like a Houston-Harris County merger/annexation. Rice President David Leebron describes the benefits and risks of a merger with the Baylor College of Medicine. It would definitely raise Rice's and Houston's profile, but there are some scary financial risks too. Very cool time-lapse video of the TMC and downtown at night from the top of the Hotel ZaZa. Hat tip to HAIF and Swamplot. "As North America's economy shifts from import and consumption toward export and production, Seattle's rise will be a model for other business-savvy cities in the West and South. Houston's close tie to the Caribbean, as well as its dominant global energy industry, thriving industrial base, huge Texas Medical Center complex and first-rate airport, all work to its long-term advantage. Arguably the healthiest economically of America's big cities, Houston is also investing in--not just talking about--its green future; last year it was the nation's largest municipal purchaser of wind energy." David Brooks of the NYT has an op-ed on nine great action items to get the country's innovation agenda back on track. Houston is still the nation's #1 home construction market, substantially ahead of followers DFW, DC, Phoenix, and Austin. The largest declines since the peak of the housing boom? Atlanta, Phoenix, NYC, Chicago, and Riverside. Notice that Phoenix is on both lists: a big decline from a big peak still puts them ahead of most. Hat tip to Jessie. If you have an Apple iPhone or iPod touch, check out a new application from Wayne at HAIF called Towrs. It "uses the iPhone's geolocation feature to display the interesting buildings near where the user is standing. Downtown Houston and Galveston are two of the areas it is designed for. It also works well in Chicago, Los Angeles, Tokyo, London, and a few other cities." I tested it and it's pretty slick. Just point your phone's web browser to Towrs.com . If you have feedback, send your suggestions or bug reports to editor@houstonarchitecture.com. "Four of those top 40 MSAs are in Texas: Houston, Dallas-Fort Worth (DFW), San Antonio and Austin. Respectively, the current dollar value of their GDPs ranked 4th, 6th, 36th and 37th in 2008. Together, they accounted for 77 percent of Texas GDP last year and seven percent of national GDP. The two giants, of course, are Houston and DFW, which each accounted for more than 30 percent of the state’s GDP. San Antonio and Austin each accounted for roughly 6 ½ percent of Texas GDP." I've always kind of thought of Austin+San Antonio as sort of nearly equal to DFW or Houston, but that's clearly far from the case. Less than half. All of them have roughly the same long-term GDP growth (since 2001) as Texas as a whole (~3%, 50% higher than the U.S. as a whole at ~2%), except for Austin, which is 50% faster again (~4.5%). Austin got a bit of an artificial boost from the bounce-back effect after a hard dot.com crash in 2000. San Antonio is the most stable, followed by average DFW, with Austin and Houston having the most growth volatility (from tech and energy+hurricanes, respectively). "Perhaps the best single measure of economic success is per capita real GDP. DFW followed closely by Houston (~$50K) were particularly strong in 2008, ranking respectively 18th and 21st nationally. Austin (~$44K) also was relatively highly ranked coming in at 43rd among the 366 MSAs. San Antonio (~$32K) placed in the middle of the pack with a ranking of 180th." We all lag in per capita GDP growth, as population increases outstrip productivity increases. Houston lagged the worst, although I think this might be at least partly related to the large number of Katrina refugees (in addition to the usual international immigration). Texas also attracted a lot of lower-middle and middle income households this decade from across the country as housing got unaffordable elsewhere, averaging down GDP per capita. I wish they had stats to show GDP per capita growth for just the people that were here the entire period. I would imagine it would be much stronger: we have a pretty strong opportunity ladder that people move up the longer they're here, but new population is always streaming in at the bottom of the ladder. "Chicago is a city of magnificent parks and world-class cultural institutions and universities. But it is also a city of high taxes, regulatory morass and aggressive unions. Is Ms. Winfrey's announcement a wake-up call about underlying problems there? She gave no substantive reasons for it, but her departure is at least the third bitter disappointment to Chicago since it felt itself to be on top of the world—when President Barack Obama gave his victory speech in Grant Park. A month ago, Chicago lost its Olympics bid to Rio; then two major trade shows that had been in the city for decades announced that they were leaving because of the city's extraordinarily high costs and the intractability of the unions." More of my thoughts on the Chicago-Houston relationship here. Arguments that Houston stadiums haven't generated economic development (and the new soccer stadium won't), and that we made a real mistake not locating Reliant Park - esp. the convention center - next to the GRB downtown (to create scale for the largest conventions). "Houston is big business, the energy industry, and a city with a remarkable amount of ethnic diversity. Both cities are windows into the future of America, but they represent different visions, socially and culturally. It’s often been said that Texas could exist without the United States, but the US would not be the same without Texas. Houston is living proof of this adage. Without Houston and the leadership the city has provided, the US could very well be a less prosperous and less diverse place. Houston, on the other hand is one of the few MLS or USL cities where every ethnic group imaginable has been attracted to the ground, without segregating themselves. The Dynamo’s model of attracting support from the broad based ethnic makeup of the region should be the model for US Soccer." "Many of the policies of Portland are not that dissimilar from those of upscale suburbs in their effects. Urban growth boundaries raise land prices and render housing less affordable exactly the same as large lot zoning and building codes that mandate brick and other expensive materials do. They both contribute to reducing housing affordability for historically disadvantaged communities. Just like the most exclusive suburbs. I believe that cities that start taking their African-American and other minority communities seriously, seeing them as a pillar of civic growth, will reap big dividends and distinguish themselves in the marketplace. This trail has been blazed not by the "progressive" paragons but by places like Atlanta, Dallas and Houston. ... Houston took in tens of thousands of mostly poor and overwhelmingly African-American refugees from Hurricane Katrina. Houston, a booming metro and emerging world city, rolled out the welcome mat for them – and for Latinos, Asians and other newcomers. They see these people as possessing talent worth having." Finally, if you missed it, definitely check out the Chronicle's Thanksgiving Day op-ed on things to give thanks for in Houston. It'll make you proud. Hat tip to Jessie for several of these links.